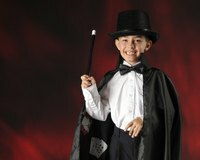 If you need a top hat for an Abraham Lincoln, magician or steampunk costume but don't want to spend a fortune at the costume shop, make your own using inexpensive craft materials. When you create your own basic top hat, you can apply any embellishments you want, such as ribbons, silk flowers or bows, to create a custom look. Measure around your head and note the measurement on a piece of paper. Cut out a rectangle from a sheet of heavy duty poster board or cardstock to the same length as your head measurement, cutting the width of the rectangle wide enough to create the height of the hat. Select the color of poster board or cardstock you want for the finished top hat. Divide your head measurement by two, and cut out a large circle from the same type of poster board or cardstock using this measurement and a large compass. Halve the measurement again, and cut out a smaller circle from the middle of the larger circle using the new measurement. This will create a doughnut shape that will become the brim of your top hat. Save the smaller circle that you cut out, which will become the top of the hat. Form the cut-out rectangle into a tube, and secure it by taping along the edges using electrical or duct tape in the same color. Place the tube on top of your head to make sure it fits. If not, repeat the first step. Moving to the doughnut shape, cut 1/2-inch-long notches outward around the inside of the inner circle. Place the tube on top of the doughnut, centering the tube over the inner circle. Fold all of the notched pieces up around the inner circle, and tape them to the inside of the tube using the electrical or duct tape. This will secure the brim to the tube. Place the cut out circle on the top of the tube, and secure it into place by taping around the seam with electrical tape. Apply the colored electrical or duct tape around the outside seam of the hat where the brim meets the tube if you want to cover it up. You can also coat the edge of the brim with colored tape to make it look more refined. Cut out another tube, doughnut and circle from felt with the exact same measurements as before. Apply hot glue to each area of the hat in turn, attaching each felt overlay on top of the cardstock base. Allow the hot glue to cool completely. Customize your hat to create the look you want for your particular costume. You can embellish the homemade top hat by hot gluing on buttons, bows, metal gears, silk flowers, a decorative ribbon or even a lightweight pocket watch. To create distinctive looks, pick out decorations that fit the character. For example, if you're making a top hat for an Abraham Lincoln costume, attach a black satin ribbon around the base of the hat. For a magician's costume, hot glue a giant silk flower or an artificial white dove on to the side of the hat.